If the balance sheet of the SNB remains as swollen as it currently is (due to purchases of foreign currency made in recent years), the SNB would have to buy additional gold worth the equivalent of around 65bn CHF. Let us assume that the SNB has to buy additional gold — and that this would require a fairly sizable amount of money. An important question is: how can the gold purchases be financed? And what are the consequences? Buying gold in exchange of foreign reserves would leave the Swiss domestic money supply unchanged; it would not be inflationary as it does not affect the Swiss quantity of money. The currencies sold by the SNB to buy gold would presumably tend to devalue against the Swiss franc; we will look closer into this aspect below. SNB gold purchases would presumably tend to raise the gold price; of course, this effect cannot be quantified with any precision in advance. That said, the Initiative would not put Switzerland on a gold standard, under which the SNB has to, for instance, redeem Swiss francs in gold. Nevertheless, the Initiative would certainly have some very positive implications. First and foremost, the 20-percent rule would make the SNB policy of money expansion more difficult. For increasing the quantity of money, the SNB would have to buy gold equivalent to 20 percent of the Swiss franc amount issued. The expansion of the Swiss franc would not only be linked to physical gold — that is the ultimate means of payment, which is in short supply. Moreover, such transactions would be “visible” and could be more easily sanctioned by the Swiss public. Furthermore, the 20-percent rule would force banks to adopt a much more cautious business approach. Fractional reserve banking, for instance, would be much less attractive and possible, as banks could no longer expect the SNB to bail them out by printing up new money. Last but not least, the Initiative would make the Swiss franc less inflationary, especially so as it discourages greatly commercial banks’ money creation out of thin air — which is also the central cause for boom-and-bust cycles. Since the outbreak of the international financial and economic crisis, the SNB has fought against the appreciation of the Swiss franc against the euro. To this end, the SNB has been buying euros against issuing newly created Swiss Francs. 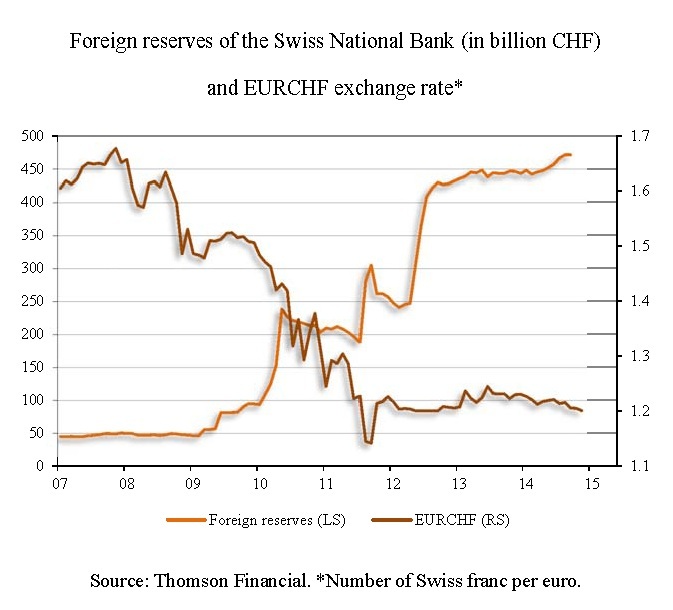 At the end of 2008, the SNB’s foreign reserve holdings amounted to just 47.4bn CHF. At the end of 2011, they had already increased to 257.5bn CHF. At the same time, the monetary base rose from 99.1bn CHF to 137.7bn CHF. Since September 6, 2011, the SNB defends a “minimum rate” of 1.20 Swiss franc per euro,4 a policy under which the SNB’S foreign reserves climbed further to 471.4bn CHF in August 2014; the monetary base increased to 373.5bn CHF. If the SNB is subjected to the 20-percent rule, the SNB could no longer continue with this kind of policy. Why? The Initiative, if put into practice, would presumably make the Swiss franc even more attractive from the viewpoint of international investors. The Swiss currency would appreciate, especially against the euro. For the European Central Bank (ECB) may very well embark upon money printing on the grandest scale, setting into motion a sizable capital flow from the euro area into Switzerland. Under the 20-percent rule, the SNB’s policy of buying euros against issuing newly created Swiss francs would no longer be possible: because new Swiss francs can only be issued if they are issued for the purchase of gold. Would an appreciation of the exchange rate hurt Switzerland economically? The answer is no. The Swiss would have to work and export less for importing the same quantities as before. Companies can slash prices and wages, should they need to ramp up their competitiveness. If put into practice, the Swiss Gold Initiative increases the chances that the Swiss can protect themselves effectively against the destructive policies which are at work in the international unbacked paper money world. It seems that the SNB cannot, or does not dare to, deviate from the money printing schemes pursued in all major currency areas. It is only the Swiss people who can bring to a halt a monetary policy that will sooner or later end in a debasement of their currency. The 20-percent rule might not live up to what a perfectly sound money regime should look like: free market money, free banking, and no central banking. However, if strictly adhered to, the 20-percent rule is by all means a highly promising starting point on a journey to truly sound money. If the Swiss put the Initiative into practice, the world will realize that there are alternatives to today’s unbacked paper money madness. In that sense, a successful Initiative could be a game changer for the better, for Switzerland and also for many other countries in this world. The author would like to thank Kristoffer Mousten Hansen, UK, for his support in preparing this article. Thorsten Polleit is chief economist of the precious-metals firm Degussa and co-founder of the investment boutiquePolleit & Riechert Investment Management LLP. He is honorary professor at the Frankfurt School of Finance & Management and associated scholar of the Mises Institute. He was awarded the 2012 O.P. Alford III Prize in Libertarian Scholarship. His website is www.Thorsten-Polleit.com.